Although bagpipes are usually associated with Scotland, there is however a longstanding history of bagpipes throughout Europe where they have been played widely, especially from the 12th century onward, catalysed by trade opportunities and significant cultural developments. With so little known about the bagpipe in Europe in the course of the first millennium of the Christian era, one or two elements may be teased out of the known history since they represent, however remotely, aspects of the wider context, socially and culturally, of piping. A distance-marker stone, now in National Museums Scotland, raised at Bridgeness, Falkirk, at the east end of the Roman Wall in honour of the Second Legion, carries sculpted panels including a figure of a musician playing a double pipe. It is dated to AD142 and represents the earliest graphic evidence in Scotland for music and context, since this depicts a ceremony of animal sacrifice for the ritual cleansing of the Legion. 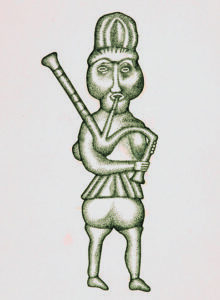 In the wider Europe, the bagpipe appears to have spread rapidly in the circumstances of what historians have called the ‘Twelfth Century Renaissance’ when towns and town life, trade and trade routes developed dramatically, and music circulated as part of a minstrel and troubadour culture in the 12th and 13th centuries. At this time Scotland’s and England’s economies began to change radically with the reorganisation of landholding, the beginnings of forms of capitalist farming, and startling innovations detectable in the surviving datable and provenanced material culture, for example in pottery, metalworking and glass. Absent from the material record is anything organological such as pipes or bagpipes. Nothing of the importance and status of the Carnyx, an Iron Age bronze horn, has been recovered in Scotland archaeologically to throw light on the use of woodwind instruments in prehistory. A small ‘whistle’ of brass, 14cm in length, with six finger-holes, was excavated at a site, Tusculum, in North Berwick. A considerable number of ‘Jews Harps’, datable to different periods, have been recovered and provide some material evidence of a rich and protean musical tradition. More specifically three tuning pegs or pins (Scottish Gaelic cnagan) for the Highland harp or clarsach have come from the National Museums of Scotland’s excavations at Finlaggan, Islay, the former centre of the Lordship of the Isles. These items can be dated to the 14th century. The bagpipe must have been played widely throughout Europe, especially in the period from the 12th century, when we first begin to learn more about it, until the 17th century when the pipes began to be displaced in music-making by new orders of instruments. From the 1100s our sources are documentary (then becoming more common), graphic evidence in the form of manuscript illumination with angels, monkeys, rabbits and pigs playing bagpipes, and carvings in stone and wood surviving usually in churches and monasteries. As a matter of note, the earliest surviving representations of the bagpipe in Scotland are the sculpted figures of the late 14th and early 15th centuries at Melrose and Roslin in southern Scotland. 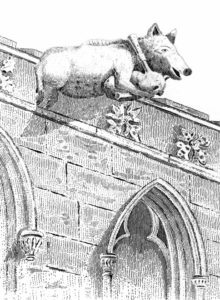 They (the piper on the Abbey at Melrose is a pig) are shown with single-drone instruments, most closely resembling the Spanish Gaita of today rather than an imagined proto-Highland bagpipe. Melrose of course was a Cistercian monastery, strongly dependent culturally on its links with France. Roslin is a collegiate chapel, a cosmopolitan status symbol and aristocratic fashion statement of medieval Scotland. These vivid representations pose questions on the status of the pipes and pipers and contemporary attitudes towards them. If the pipes were an angelic instrument but also notionally played by pigs, a medieval symbol for gluttony and sin, attitudes were ambivalent. 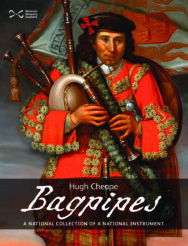 We learn about the bagpipe in Mediterranean countries such as Spain and Italy, in the Netherlands and England. Players or minstrels travelled the roads and seaways of Europe and provided some of the most popular entertainment in court, castle and burgh. Payments by the kings of England for music and minstrelsy are document in this period, and patronage was a matter of fashion as well as taste to be emulated by other ranks of society. The earliest possible references to piper-minstrels in Scotland are for the reign of David II (1329-71). They are certainly travelling folk, possibly from England or the Continent, rather than court appointments. They brought news and gossip, as well as music and song, to a highly localised world. The function of the bagpipe was therefore to provide music for song and dance, and also evidently for work, to enliven and quicken toil. A sense of Europe as an entity with its own cultural traits (such as music) emerged, particularly under the influence of the Christian church and pressure from without. Under attack from Islam, the counter-attack was launched by the Papacy, and a series of military expeditions was mounted in the 11th, 12th and 13th centuries to recover Jerusalem and the Holy Land. The linking of Western Europe to the Eastern Mediterranean and prolonged contacts with the Arab world, particularly through Byzantium, Venice, Sicily and Spain, reintroduced Western Europe to the arts and sciences of the Greek and Roman, a civilisation which had also evolved with the learning of Islam. Traders and colonisers brought back musical instruments such as the lute and other string instruments, and wind instruments such as the shawm which was also widely distributed throughout Asia. 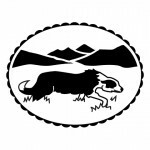 Professor Hugh Cheape has devised and teaches a postgraduate programme, MSc Cultar Dùthchasach agus Eachdraidh na Gàidhealtachd, at Sabhal Mòr Ostaig, the National Centre for Gaelic Language and Culture. The MSc has grown out of his curatorial and ethnological work during a career in the National Museums of Scotland where latterly he was Principal Curator in the Department of Scotland and Europe. He joined the National Museum of Antiquities of Scotland in 1974 as a Research Assistant with Professor Sandy Fenton and was involved with the creation of the Angus Farming Life Museum in the Angus Folk Museum, the National Museum of Scotland, the Museum of Scottish Country Life at Wester Kittochside (now the National Museum of Rural Life) and the Museum of Piping in the National Piping Centre. He has published in the subject fields of ethnology and musicology, including studies in Scottish agricultural history, vernacular architecture, piping, tartans and dye analysis, pottery, charms and amulets and talismanic belief. His books include Periods in Highland History (1987) with I F Grant, Tartan. The Highland Habit (1991), Witness to Rebellion (1996) with Iain Gordon Brown, The Book of the Bagpipe (1999), Bagpipes. A national collection of a national instrument (2008), and he has edited Tools and Traditions. Studies in European Ethnology presented to Alexander Fenton (1993) and ‘A very civil people’: Hebridean Folk, History, and Tradition. Essays by John Lorne Campbell (2000). 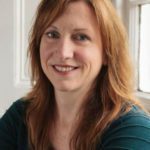 From 1997 he worked with the School of Scottish Studies on the Tobar an Dualchais / Kist o Riches project to digitize the sound archives of John Lorne Campbell, the School of Scottish Studies and the BBC.